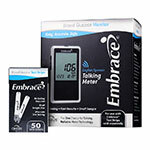 Embrace Blood Glucose Test Strips are for use only with Embrace No Code Embrace Blood Glucose Meter. They offer alternate site testing and require only a small sample size. No coding is necessary for these test strips. Package contains 50 Test Strips. 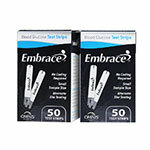 Embrace Blood Test Strips are for use only with Embrace No Code Blood Glucose Systems. They offer alternate site testing and require only a small sample size. No coding is necessary for these Embrace Strips. Package contains 50 Embrace Diabetic Test Strips. 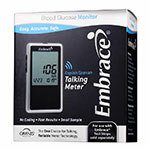 Use only with Embrace No Code Blood Glucose Systems. Meter Speaks in English and Spanish. Alternate site testing - palm or forearms. Small sample size - only 0.6 microliters. Package of 50 Test Strips. Confirms that the test strip is positioned correctly. Pinpoint technology detects the sample. Fill detection verifies that the sample is adequate. Insert the test strip to turn on the Embrace Meter. Wait for the blood drop symbol to appear on the LCD. Lance your finger on clean/washed hands. Bring your lanced finger close to the tip of the test strip. Blood will be pulled in when in contact with the tip of the test strip. Your blood glucose result will show up in 6 seconds. Important: Immediately close the vial cap of the test strip bottle tightly after each use. Keep the unused test strips in the original bottle. DO NOT leave any test strips outside the bottle while not in use. DO NOT reuse test strips. Test strips are for single use only. Carefully discard used test strips and lancets in proper waste containers. These test strips will have a minimum expiration date of 12 months. The container is the hardest thing to deal with on these strips. They offer better protection for them, though. Love that they do not require as much blood as some others. Too, I love the price of these top shelf testing strips. 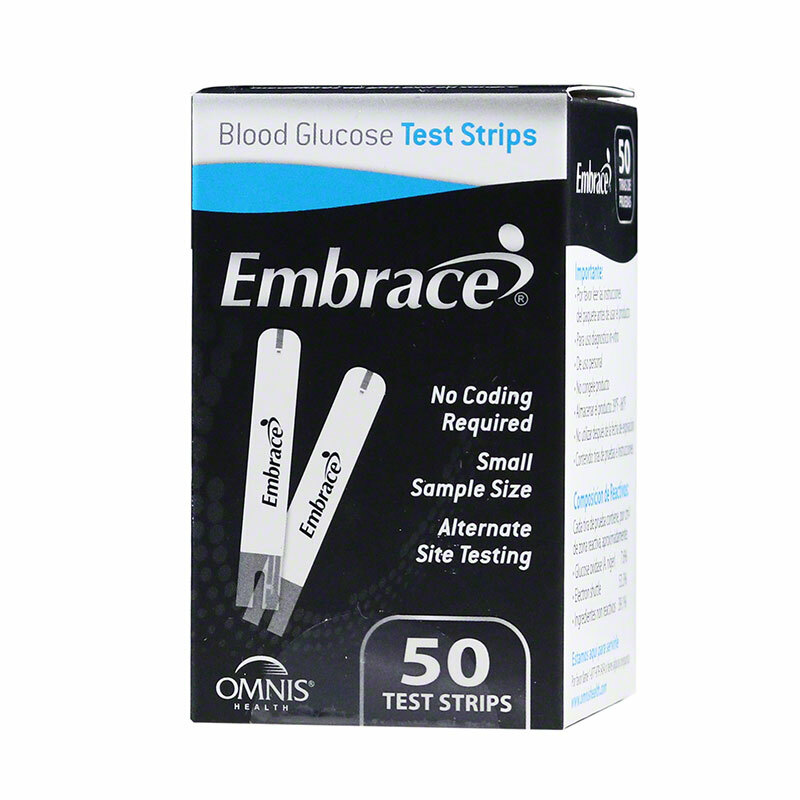 Embrace strips are by far the best value for your money for testing glucose levels. You get 50 strips for under $10. The machine is simple to use, and I find that I now test 2-3 times a day per my doctors recommendation. A little difficlt to get used to... but pretty accurate as compard to Free Style Lite.